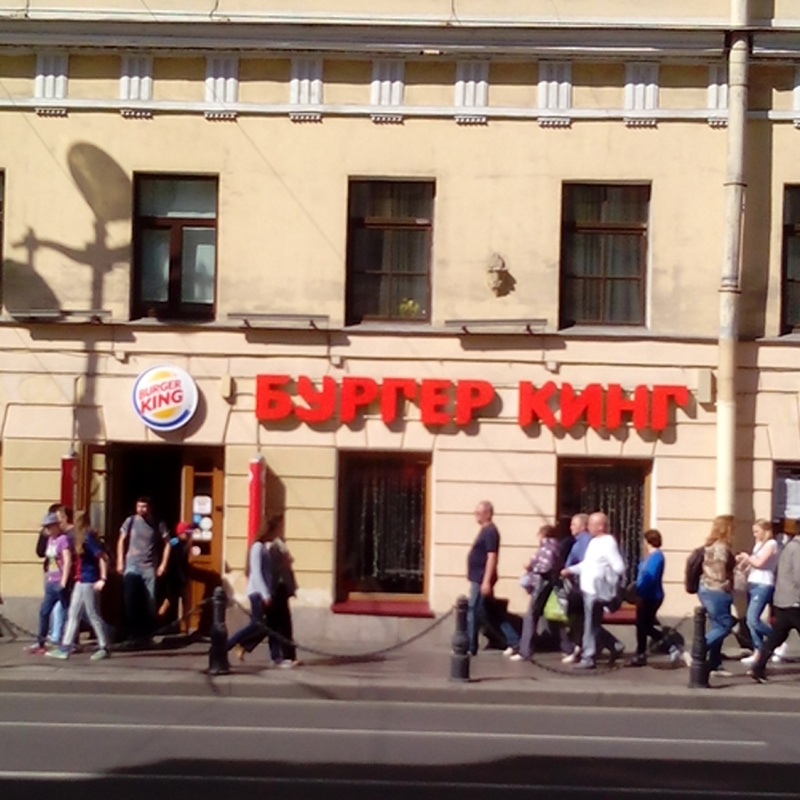 A recent trip to St Petersburg in Russia was a delight. 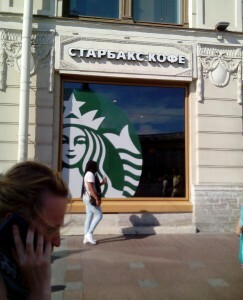 I was there at the end of June, during the period of the White Nights, when the sun doesn’t set. 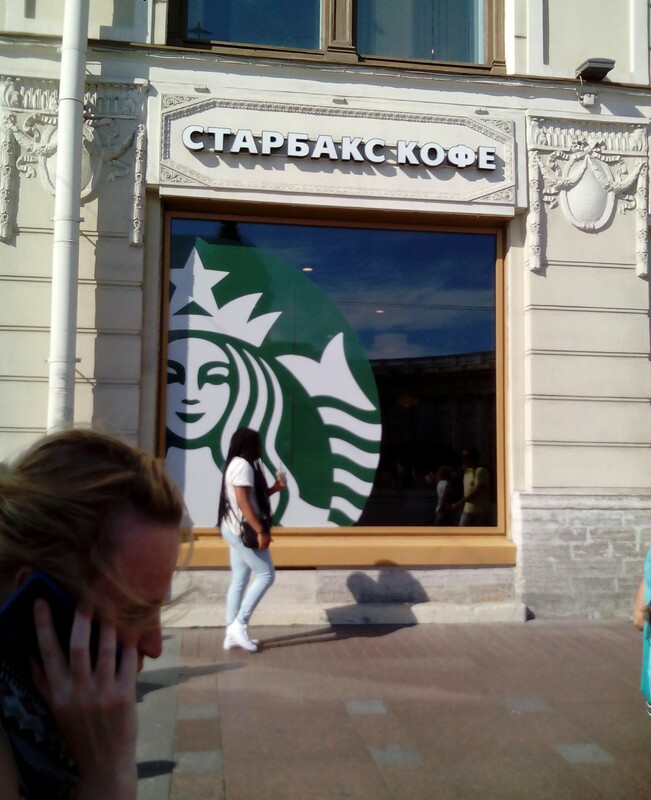 It’s a magical time to visit this gorgeous city but among all the world-class art galleries, stunning baroque architecture, and fascinating history I found myself seduced by the language and in particular the beautiful Russian Cyrillic alphabet. The Cyrillic alphabet is named after the Byzantine scholar Cyril who with his brother Methodius created the first slavic writing system in the 9th century to help translate the Bible. 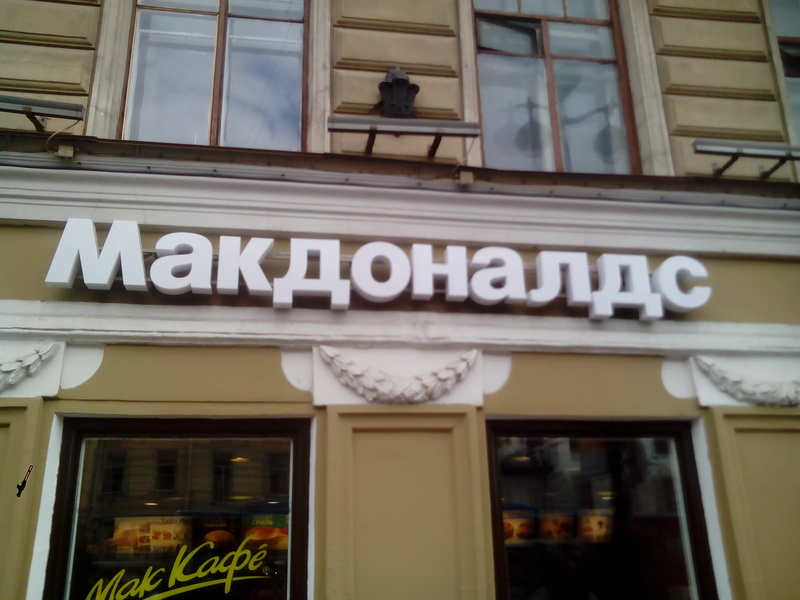 The modern Russian alphabet currently has 33 letters: 10 vowels, 21 consonants, and 2 signs (ь, ъ). But in common with other languages, various changes have been made to the printed form of the language over the past 200 years, including the introduction of new letters, the eliminations of others, and attempts at making spellings more consistent. 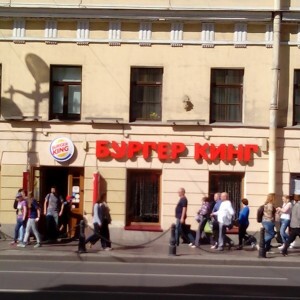 Because the Cyrillic alphabet has some letter forms that look similar to our English Latin alphabet, there is a temptation to assume they have the same sounds. For instance, there are letter forms that look like our A, B, C, E, H, K, M, N, O, P, and T. And, although the A, E and K sounds similar to ours, the C turns out to sound like our S, and the H turns our to be the sound for our N. There’s also a letter that looks like a backwards N that sounds like our I and a letter that resembles a lower case r that sounds like a G.
Thankfully, the internet is a quicker option. 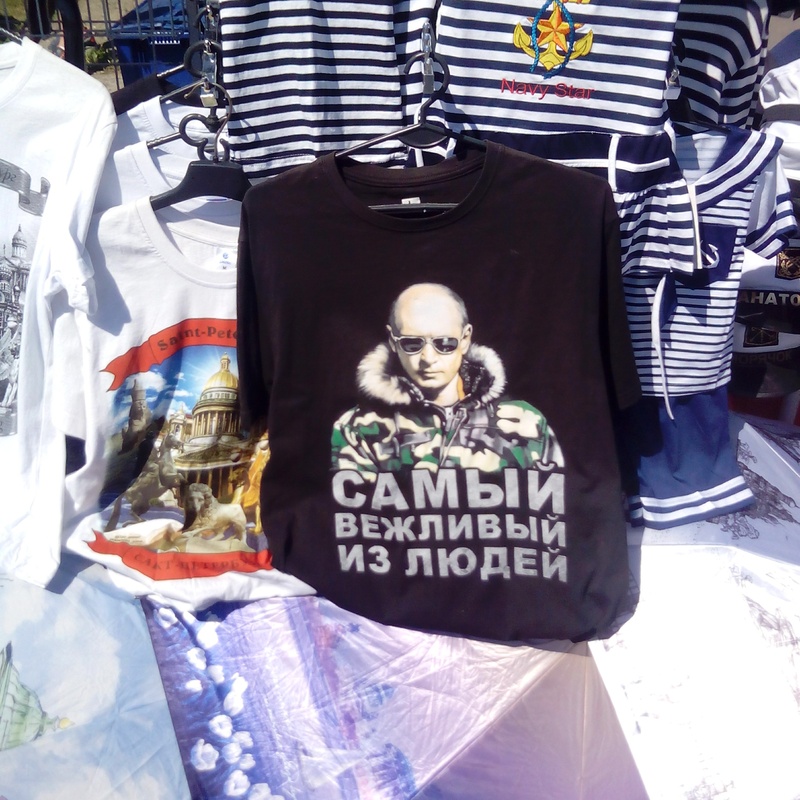 A quick search turned up this article on reuters, which tells me that the souvenir slogan – which can be found on t shirts, mugs, even phone covers – says “The most polite of people”. Maybe I’ll just stick to the fast food chains. 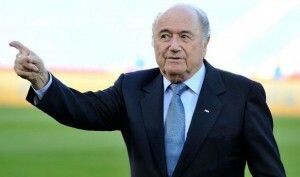 Last week’s arrest in Zurich of seven members of FIFA (football’s world governing body) threw an intense spotlight on the subsequent re-election of FIFA’s president, Sepp Blatter. But amid all the column inches written and all the media and internet speculation circulating about Mr Blatter, there was one wonderful moment that brought some much-needed relief. On BBC Radio Four’s Any Answers programme, someone unintentionally (but hilariously) referred to FIFA’s president as Bett Slapper, instantly bringing to my mind an image of Mr Blatter with huge hoop earrings and an off-the-shoulder leopard-print top like a barmaid from Coronation Street, or a Carry On… film. This kind of effect where sounds get mixed up to produce a phrase with a different meaning to the one intended is called a spoonerism. This particular speech error is named after the Reverend William Archibald Spooner (1844–1930), an Anglican priest and Oxford scholar. Although there seem to be many examples of his own spoonerisms, it seems likely that most of these were made up and circulated by his students. A toast to “our queer old dean”. It is kisstomary to cuss the bride. Will nobody pat my hiccup? When our boys come home from France, we will have the hags flung out. Apocryphal or not, such accidental linguistic mix-ups make for much amusement and the term ‘spoonerism’ seems to have been established by 1921. While most spoonerisms are unintentional slips of the tongue (my own common spoonerism is par cark instead of car park), spoonerisms can be a source of deliberate and clever wordplay. I’ve got an eye for signage and typography and without being an expert I certainly know what I like. And I love ghostsigns – those lovely, faded, handpainted signs you sometimes see on the sides of buildings. I first started noticing them a few years ago and when I joined Instagram last year I finally found a place to publish my ghostsign photos. 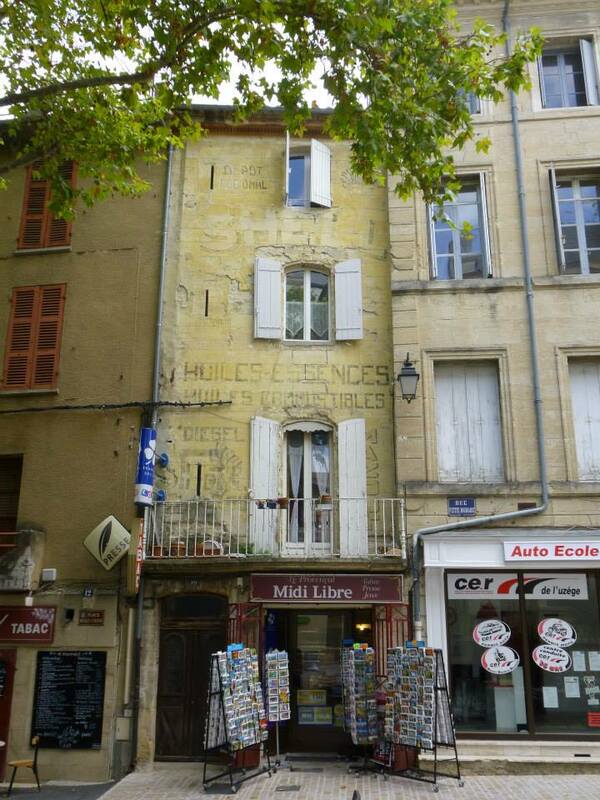 There are plenty of ghostsigns around if you look for them – you’ll find them in cities, towns and even villages up and down the UK. They were the billboards of their day but were created by highly skilled signpainters rather than print and digital technology. I often wonder what these beautiful signs would have looked like in all their freshly-painted glory – they must have been dazzling. 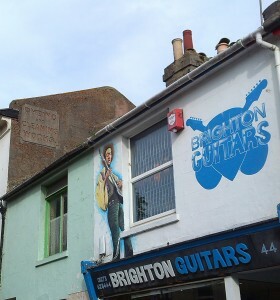 Certainly more aesthetically pleasing than most of the shop signage and billboards on our high streets today. It’s also interesting to try to puzzle out the words and images and wonder about the history of the sign and the company or product being promoted. 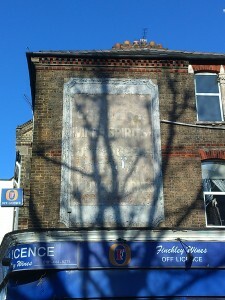 Here’s one of my favourite ghostsigns, located on Heath Street, Hampstead in north London. It says “Established 1746 Chas B King Estate Agent Decorator Gas, Hot Water & Sanitary Engineer.” Clearly an industrious man, that Chas King. 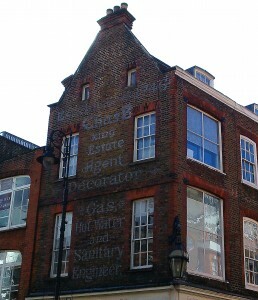 And I love the fact that the premises are still used as an estate agents today – Goldschmidt of Hampstead. I recently went on a fascinating walking tour of Stoke Newington, in north London to see some wonderful ghostsigns – some of which are over a 100 years old. The tours are run by Sam Roberts, who runs the Ghostsigns website and blog, and if you’re at all interested in signage, typography, and local history I’d strongly recommend you join one. 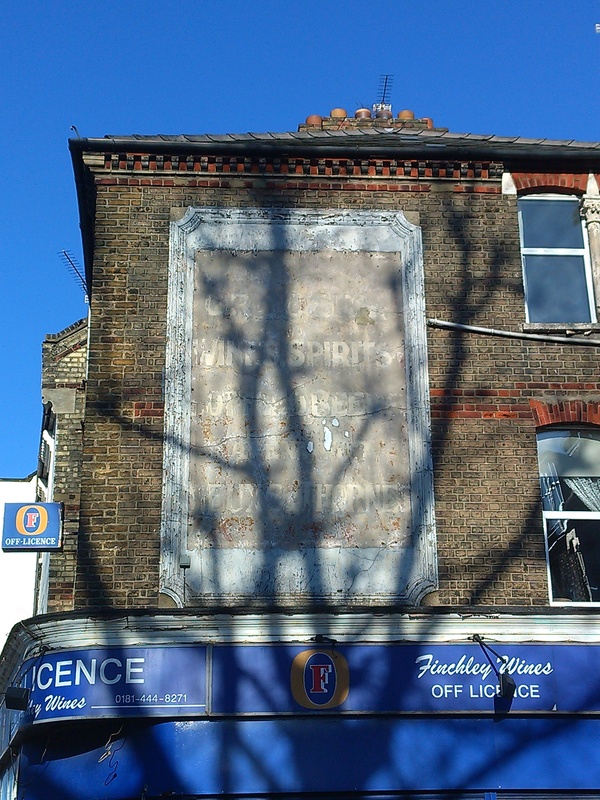 Stoke Newington has many fine ghostsigns due to the rapid development of the area in the 19th century. 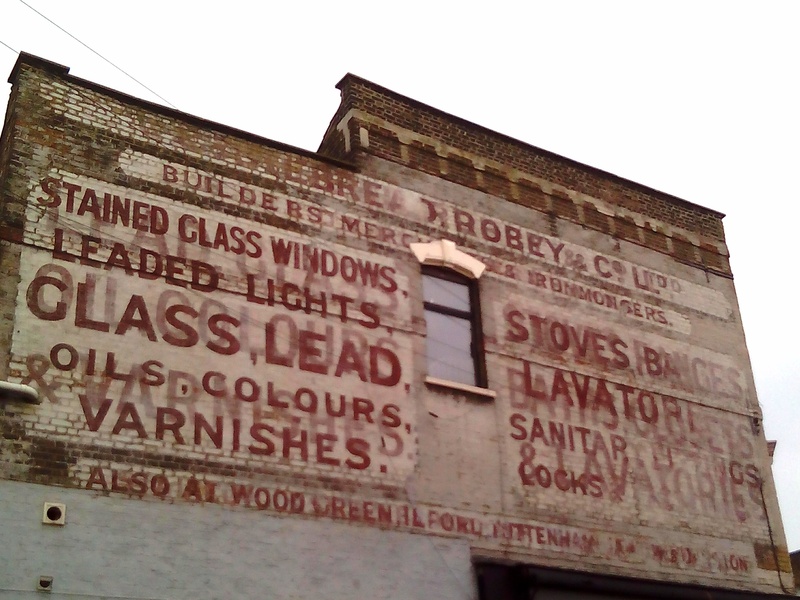 The fact that Stoke Newington village has Conservation Area status means that many of these old signs are not lost due to demolition and high rise development. As Sam points out, these lovely palimpsests are not entirely safe as they are still at the mercy of London’s weather, pollution, and the whims of local landlords. 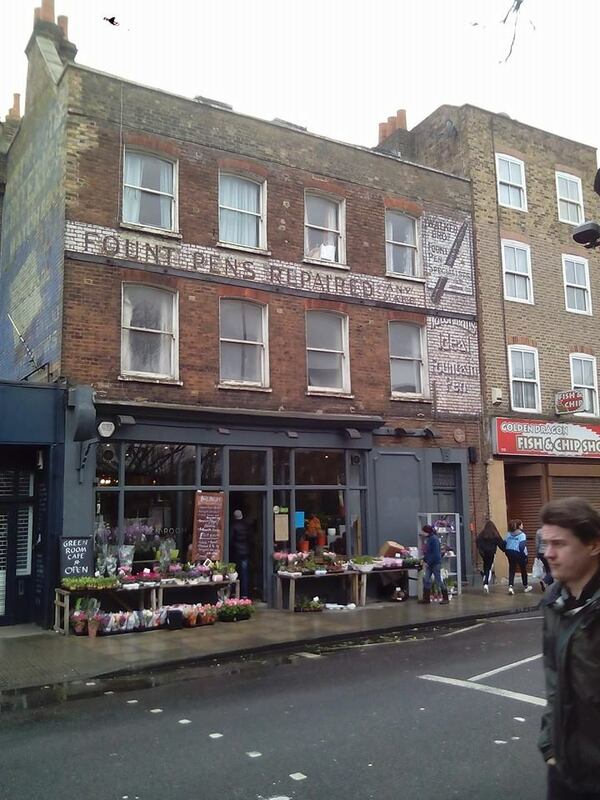 This beautiful ghostsign advertising fountain pen repairs by Walker Bros has been awarded Local Listed status by the Hackney Society and English Heritage – it is also the sign that first got Sam Roberts interested in the history of ghostsigns. 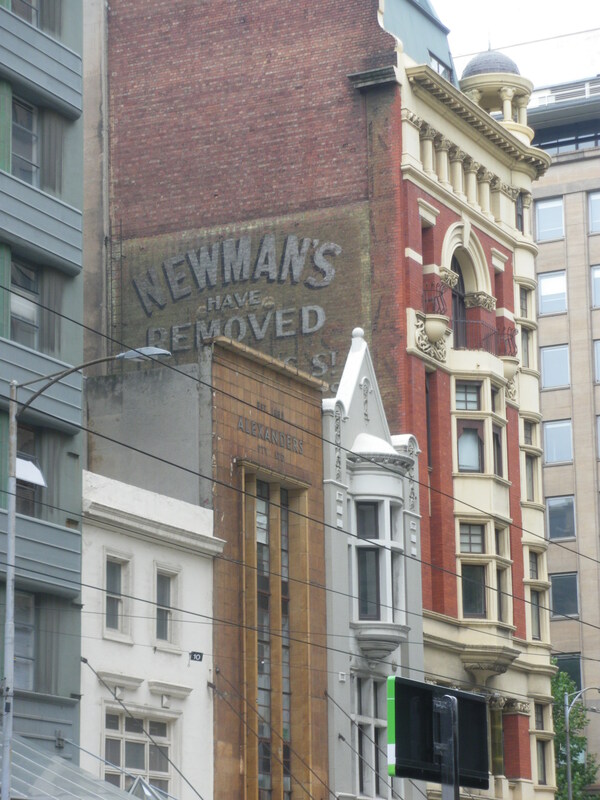 You can just see another large (and blue) ghostsign on the left-hand side of the building. This one – for Edw. 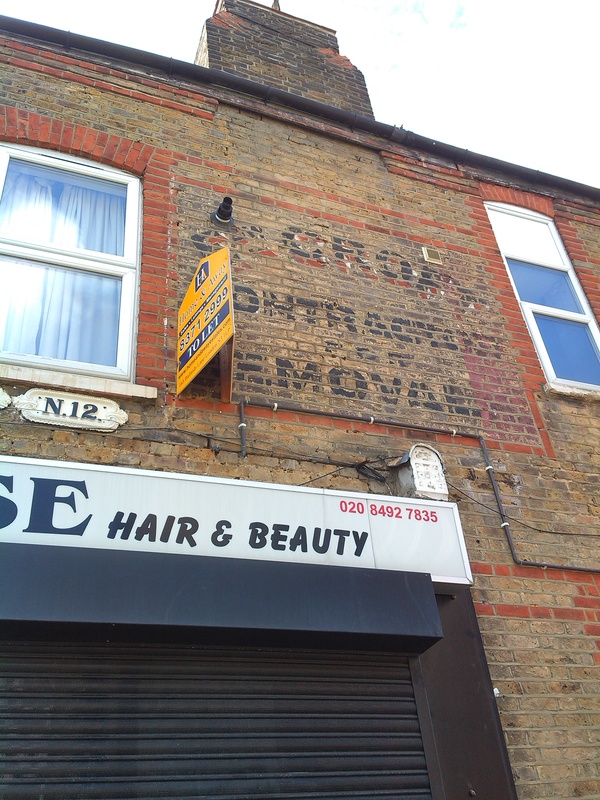 Croft, Contractor & Removals – appears to be set within a brick frame and the handpainted letters have a lovely drop shadow. 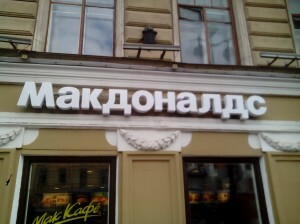 I find the modern signage around it so ugly in comparison. This glimpse of an old ghostsign (you can just make out the word Electric) in Finchley Central was revealed when a billboard was replaced. 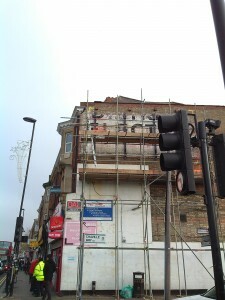 It is covered up again new with a new billboard. 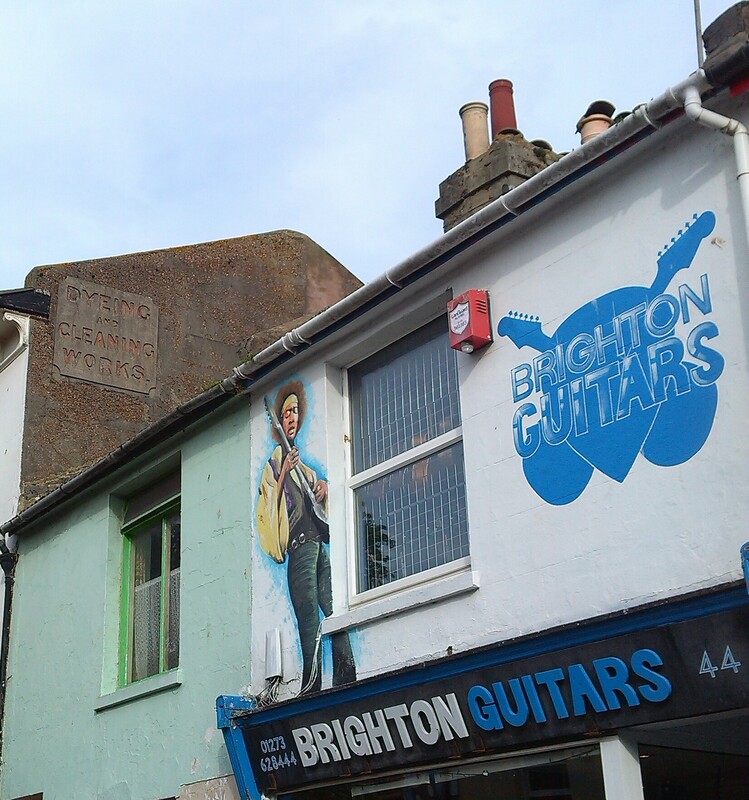 I particularly like this shot as it juxtaposes an old ghostsign (high up – Dyeing and Cleaning Works) with a modern handpainted sign of Jimi Hendrix and Brighton Guitars – possibly a ghostsign of the future? If you want to spot a ghostsign, Sam Roberts recommends not just looking up but also to look back over your shoulder. I missed the now cult TV show Buffy the Vampire Slayer first time around but I’m currently watching my way through the third series with my teenage daughter. 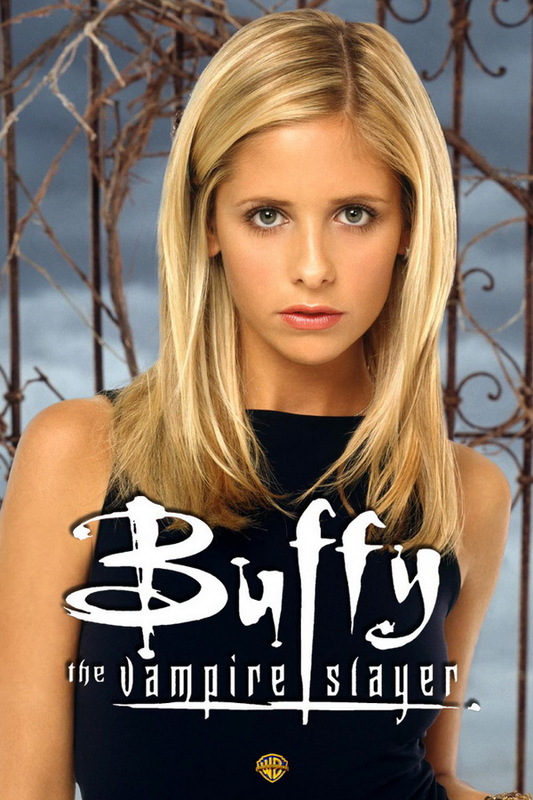 Created by writer-director Joss Whedon, Buffy is an American TV series which originally aired from 1997 to 2003. One of the distinguishing features of the series is its playful and inventive use of language – particularly the dialogue spoken by the slayer herself and her friends (the Scooby Gang). The series turns on its head the whole cinematic trope of the ‘helpless blonde girl getting killed’ – in that Buffy has super strength and, although still attending Sunnydale High School, slays the vampires and demons that plague the town, which sits atop the ‘Hellmouth’. Bonnie Kneen wrote a brilliant analysis of the language of Buffy in an Oxford Dictionaries blog post. The use of ‘in’ words for the gang is an important feature. They talk of ‘slayage’ and ‘kissage’, they use compound words, and incorporate pop culture references. Nobody ‘freaks out’ – they ‘wig’. Analysis is fine and dandy but there’s nothing like going direct to the source to really grasp the Buffyness of Buffy. If you’ve never seen an episode of Buffy I strongly recommend you head over to Netflix. In the meantime, here’s a video clip on Buffy speak … tempted, much? I love the sound of words and I love looking at words. So, I tend to think that kinetic typography is a wonderful thing. Abbott & Costello were a hugely popular American comedy double act in the 1940s and 50s, appearing in films, TV, on radio and the stage. “Who’s on first?” is a routine full of quick-fire verbal patter or wordplay developed while they performed in vaudeville in the late 1930s. Here’s one version. The comedy springs from the increasing confusion and exasperation felt by Costello as he tries to understand the names of baseball players as outlined by Abbott and their positions on the team. It’s so simple, and so brilliant. 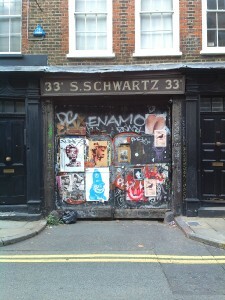 Who’s on First Typography from jimmy zito on Vimeo. Love it or loathe it, slang (or non-standard English) is all around us. Language purists try in vain to impose rules that would keep language constrained to what they would define as ‘proper’ usage but the joy of English (and of slang) is that it throws off all attempts to tie it down. Slang is inventive and playful and shows how flexible the English language is. More than anything – it’s fun. Here’s a lovely short film exclusively featuring London slang (past and current) called ‘Be Lucky’. It was made by photographer and filmmaker Jenny Keogh with the help of slang lexicographer Jonathon Green (compiler of Green’s Dictionary of Slang). ‘Be Lucky’ is a film celebrating London slang. Loaded with humorous insults and exchanges, it includes everything from Cockney to Street slang throughout the last five decades. This film packed with 94 slang phrases, is sure to educate and entertain people in London and beyond. The basic plot is based on gossip about a couple who were thrown out of the local boozer. Jenny Keogh & Jonathon Green have combined their skills to bring the written slang dictionary to life. This film aims to preserve London slang of the past whilst highlighting slang used today. They hope to make a series. Slang is forever evolving and in itself is a language, created by people for the people. Enjoy it. Share it. Celebrate it! There’s a generation of young people for whom letters – especially handwritten letters – must seem old-fashioned and quaint. In an age of instant communication via text, emails, Twitter and Facebook, most young people won’t have written any letters themselves, except perhaps to the tooth fairy, or Santa, or the occasional thank-you note. But here’s the thing: even if most of us are too ‘time-poor’ to sit down and craft letters on a daily basis, most people surely still get a thrill out of receiving one. So the art of letter writing may well be lost but our fascination with letters endures. The attention being given to the First World War during this centenary year is making me think of my paternal grandfather, Alfred Walder, who fought in the war and survived. Sadly, he died just after I was born so I never got to know him. My Dear Bro Alf, Winnie & Babs. The letter doesn’t contain much in the way of news but it is brimming with cheerfulness and love. The Babs referred to is my uncle John, who was a newborn at this point and it seems grandad had just sent Percy a photograph of Winnie and the baby. PS I am keeping a four hour watch whilst writing this. I guess you’re between the sheets. Goodbye. I find this letter genuinely moving. 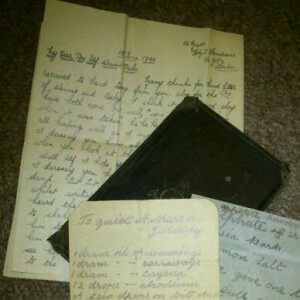 I never met my grandad or Percy but having heard how close they were, these flimsy sheets of paper provide a connection to the past and a little glimpse into their lives. My grandad survived WW1, even though he was in a cavalry unit. Fortunately, he was kicked in the knee by a horse rather badly while in France and was shipped back to England. My father always spoke of grandad’s amazing affinity with, and love of, animals so it was especially pleasing to discover a couple of handwritten notes in the battered wallet that provide recipes for dealing with horses. There are other recipes for Appetite Powder, Oils to Make a Horse Follow You, and (ironically) How to Quiet A Kicker. Maybe grandad forgot to give that horse in northern France his quietening dose… If grandad hadn’t received the wound that sent him back to England things may well have turned out very differently. If he hadn’t survived the war, my father wouldn’t have been born, and I wouldn’t be writing these words. I’d urge you to read the blog and follow @LettersofNote on Twitter. The blog has been so successful that a compilation of letters has now been put together in book form. 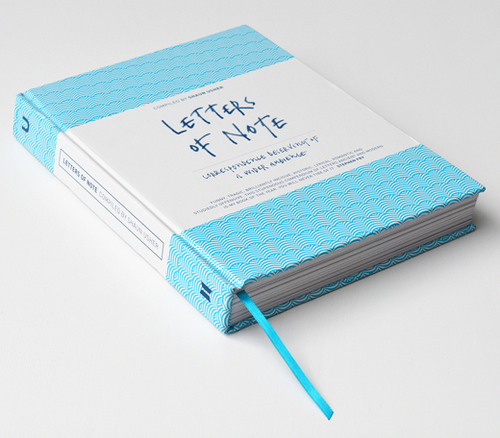 Letters of Note - Correspondence Deserving of a Wider Audience, compiled by Shaun Usher. There are letters from the rich and famous as well as the more humble and ordinary. All have something to say, and they say it in a great variety of ways – funny, sad, wise, and flippant. This article in The Guardian tells you more. I like words. I like fat buttery words, such as ooze, turpitude, glutinous, toady. May I have a few with you? Having a word – how could he fail? Back in 2011, The Open University produced a fun series of short videos called The History of English in 10 minutes. Produced by the Open Learn section of The Open University, these videos are a fantastic free resource to anyone interested in the evolution of English. ‘The History of English’ squeezes 1600 years of history into 10 one-minute bites, uncovering the sources of English words and phrases from Shakespeare and the King James Bible to America and the Internet. Bursting with fascinating facts, the series looks at how English grew from a small tongue into a major global language before reflecting on the future of English in the 21st century. If you’d rather savour them one at a time, then go to the OUlearn YouTube channel here. With the nights drawing in and temperatures beginning to drop here in the UK, what a tonic BBC4′s Italian police drama Inspector Montalbano is proving to be. I can swap grey, chilly London for the gorgeous sunlit laneways and Baroque churches of the fictional Sicilian town of Vigàta, and especially Montalbano’s beach-side apartment. The TV series is unlike any British police procedural. And it’s different again from the highly stylised and dark Nordic offerings such as Wallander and The Killing. It has a curiously dated feel – the opening credit sequence looks like it could have come from the 1970s or 80s. The characters are generally exaggerated – Commissario Montalbano is gruff but caring (and always seems to have attractive women trying to seduce him). He loves good food and wine. Women are either very attractive (and attracted to Montalbano) or worn-out middle-aged cleaners. There are no female police officers to be seen. Montalbano’s colleagues are effective but somewhat stereotypical and in one case (Caterella ) a simple-minded clown. Oh, and the plots are often diffuse. So why watch it? For me, it’s a winning combination of stunning locations, loveable characters, and… hand gestures. I always knew that hand gestures were an important part of any Italian’s vocabulary but with this TV series I’ve become fascinated with how much can be said with your hands. 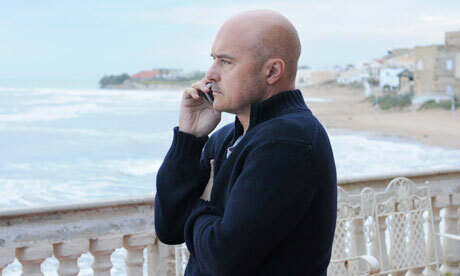 The interplay of gestures between Montalbano and his colleagues is mesmerising. 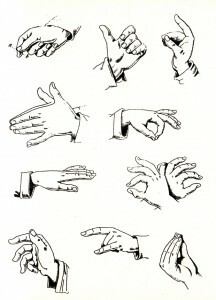 Earlier this year, The New York Times published a piece titled: When Italians Chat, Hands and Fingers Do the Talking. 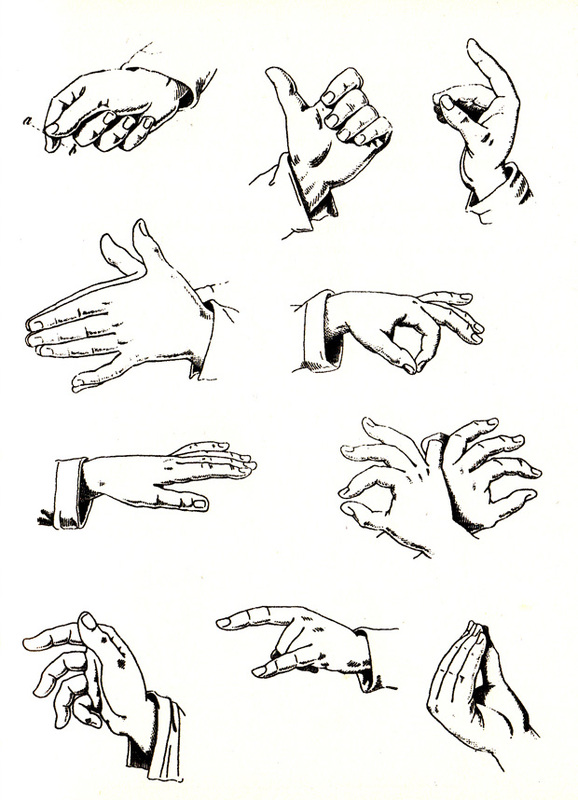 It seems likely that exaggerated hand gestures probably first appeared in polyglot Naples where many different languages were used and gestures were a way of making sure people could understand one another. Flamboyant gestures also help to get you noticed. Can you figure out what they mean? From left to right: money, past times, affirmation, stupid good, wait a moment, to walk backwards, to steal, horns (cuckhold), to ask for. I’m definitely going to start sprinkling a few of these into my daily conversations. I’ll leave you with a short montage of Inspector Montalbano in action – Ciao! On August 31 2013, record-breaking long-distance swimmer Diana Nyad, aged 64, became the first person ever to swim the 110 miles of open water from Havana, Cuba, to Florida. 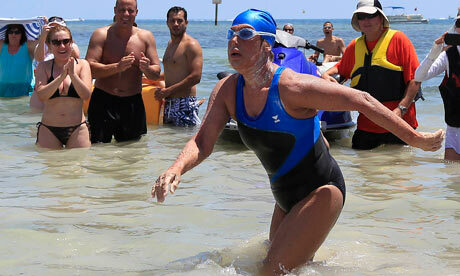 She swam this distance in 53 hours and without the aid of a shark cage. While this is a truly impressive feat of endurance and determination (this was her fifth attempt), what struck me was that with a name like Nyad she couldn’t have done anything else. Nyad sounds like naiad – naiads in Greek mythology were water nymphs or spirits. That’s cute, I thought. Then I noticed that naiad is an anagram of her first name – Diana. *Cue dramatic chords* So, could this just be coincidence or is something else in play? There is a notion – called nominative determinism – that a person’s name can somehow influence the type of work or activities they do, and maybe even their character. So, perhaps in naming her Diana, the Nyad parents had set something inevitable in motion? Once you start to be aware of the phenomenon, you’ll see examples of nominative determinism everywhere. For instance, where I live in Finchley, North London, there is a local dentist called Mr Fang. Usain Bolt Olympic champion and world record holder for the 100m and 200m. Rich Ricci CEO of Barclays Capital who received a bonus package of £44 million in 2010. Bill Cash MP who claimed more than £15,000 in expenses to pay his daughter’s rent. Chris Moneymaker The first amateur winner of the $2.5m prize World Series of Poker in 2003. Sara Blizzard Weather presenter for East Midlands Today. John Doolittle & Tom DeLay Republicans who argued against any action on the ozone hole. Wright Hassall Solicitors’ firm in Leamington Spa. And, my favourite: Dr. Richard Chopp Leading urologist specialising in vasectomies.